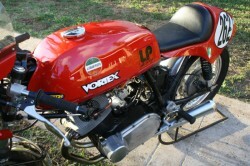 Here, we’ve got a 750 Laverda parallel-twin that supposedly makes almost 90hp, backed up by a dyno sheet. That suggests some serious work has gone into this bike’s motor, since the parallel-twin motor originally produced about 60hp. 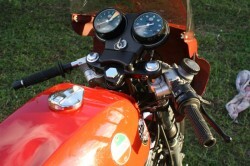 At At 500lb fully fuelled they were heavy bikes, and the stock motor powered the bike to a 112 mph top speed. They vibrated far less than a typical British twin, but still had plenty of character and the bikes from Breganze, Italy were famed for their durability. 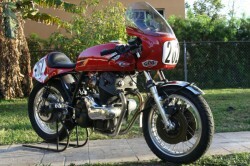 Here we have a Laverda 750 race bike that was raced for approximately 15 years. The bike runs very good and strong with no funny noises or smoke from the exhaust. Starts up with one push of the ignition. It use to be a bump start bike but was just recently converted back to electric start. I do have some documentation that will also go with the bike like, dyno sheet showing close to 90 hp, a clear title and some track day registration forms. The front and rear tires are like new Dunlop K591 race tires. I don’t know any details of the internals however it’s been highly modified in order to push out that much hp. 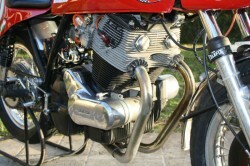 The exhaust muffler is an original SFC pipe, also has electronic ignition. Carburetors are Dellortos 38mm. 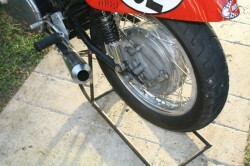 The clip ons I believe are Paoili brand, fork brace and steering stabilizer. . The speedo shows 9k miles however I don’t believe it has the original gauges. The vin # on the frame is 8902 and the motor is 16439. 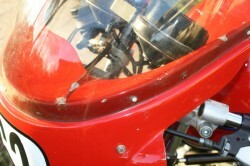 There is some damage on the fairing (see last picture) and the top side of the tank has a slight dent. Also, the stickers you see on the right front side of the tank are covering paint chips. The original eBay ad doesn’t have very much information, but what is there suggests that, if the price stays reasonable, this might be a very cool bike for someone interested in a vintage racer or willing to do some work to convert this back into a street machine. It has the stock dash and instruments and just needs to be wired up for lights, having recently been converted back to electric start. It’s not perfect, but this is a really cool machine that’s ready for the track.